What Is a 457(b) Retirement Plan? A 457 plan or 457(b) plan is an employer-sponsored, tax-favored retirement savings account. This type of plan is offered to state and local government employees, including police officers, firefighters, and other civil servants. Some high-paid (or "top hat") executives at certain nonprofits like hospitals, charities, and unions also get access to 457(b) plans. You can think of the 457(b) plan as a 401(k) for the government-worker set. But there are a couple of unique differences that make a 457(b) even more attractive. A 457(b) plan is a lot like a 401(k) or 403(b). And it's not just because they all get their cryptic parenthetical names from their spots in IRS tax code. These plans all offer individuals a great way to save for retirement. A 457(b) plan is offered through your employer, and contributions are taken from your paycheck on a pre-tax basis, which lowers your taxable income (a good thing come tax time). You can invest the contributions in mutual funds that you choose from an array of options. And the interest and earnings on that money are not taxed until you withdraw the funds at retirement. That means the money has the opportunity to accumulate more quickly in the meantime. Unlike a 401(k) or 403(b), if you are leaving a job or retiring before age 59 1/2 and need to withdraw your retirement funds from a 457(b), you won't pay a 10% penalty fee. This is a big distinction that makes this type of plan even more attractive than its peers. Participants in a 457(b) plan can generally contribute as much as $18,000 to the plan in 2017. If you are age 50 or older and your employer allows something called catch-up contributions, your limit increases by an additional $6,000. This is similar to a 401(k) or 403(b) plan. 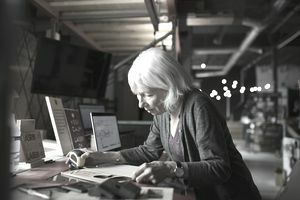 But here's another benefit: with a 457(b) plan, some employers offer an even better catch-up contribution deal three years before retirement age. You may qualify to contribute twice the annual limit—or $36,000 in 2017. If you are someone who gets excited about the power of tax-deferred investment compounding, this is an advantage to get excited about. Of course, the amount you contribute to a 457(b) plan each year cannot exceed 100% of your salary compensation. Another benefit to the 457(b) plan is they work well with other plans. Teachers, for example, may be offered both 403(b) and 457(b) plan options. If you have a combination of two plans—a 457(b) and a 403(b) or a 457(b) and a 401(k)—you can contribute the maximum amount to both plans. That brings your annual elective deferral limit up to $36,000, even if you are younger than age 50. That's not even including catch-up contributions or any applicable employer match. Limits typically increase every one to three years. In the past, they typically adjust for inflation in $500 increments but remained unchanged for the 2017 tax year. Some employers may match the amount that you contribute to a 457(b) plan up to a certain limit. If you are lucky enough to work for such an employer, take advantage of it by contributing to the plan at least as much as the match. If the match is 50% and you put in $1000 per month, your employer is giving you an extra $500. It's like the raise you've been waiting for. Not all government employers are required to offer employees access to a 457(b) plan, as nonprofits are required to offer 403(b)s. But if your employer does not currently offer a 457(b), it doesn't hurt to lobby for one. When it comes to retirement plans, you would be lucky to have the chance to save in a 457(b). The information included here is not professional financial advice. It is intended for guidance only. Any private (non-governmental) websites linked to from this piece are included for informational purposes and cannot be verified. While we every effort is made to ensure that this information is correct, it may vary depending on your own personal circumstances.